Beyond The End Of The Road. Picture by Trevor Walker. A new musical about Northumberland life is heading to Whalton — and villagers will be taking centre stage. Beyond The End Of The Road has been produced by Morpeth-based performing arts company November Club from the idea of musician Kate Doherty. Ms Doherty was inspired to write music for the show after moving from the city to a hill farm near Blanchland, and the November Club travelled the county to get ideas for stories, characters and anecdotes. 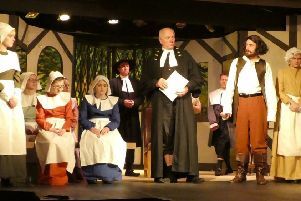 Villagers in Whalton have been involved from the initial story-gathering sessions, and some will be joining the ten-strong cast on stage. Families have also taken part in a ‘make and do’ day to create bunting to decorate the hall, and Karen Fenwick, from Whalton WI, has made a cake with an equine theme to share during the interval. The show culminates in a ceilidh, compered by acclaimed Northumbrian musician Alistair Anderson. It is at Whalton Village Hall tomorrow (Friday), at 7.30pm, and is expected to be a sell-out.